Friends and family who are not climbers have often asked us: “When you take your baby climbing, do you strap her onto your back and climb?” Hell, NO! With a newborn, life gets a little bit crazy. To me, the domestic life has appeared at first to be like a prison. At home, the first two months of my daughters life, I would easily get overwhelmed by all there was to do and get distracted from what really matters: bonding with my baby and as a brand new little family. 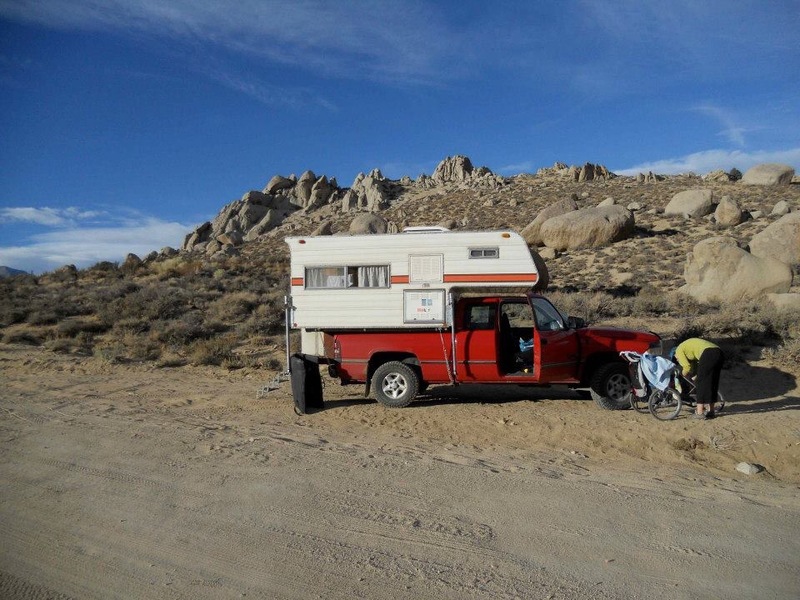 In an 8-foot truck camper in the middle of the Sierra Nevada, the home-related chores are pretty much reduced to none. Once you’ve figured where you’re going to sleep and what you’re going to eat, your time is all for your family and this is pretty fantastic. Sipping your cup of coffee in the desert morning sun with a sleeping baby nearby pretty much makes you forget about the the pile of dirty laundry, the mail to pick-up, etc. Physicians recommend to wait at least 6-week after birth to gently start exercising again, and this should be done after medical consultation to ensure the recovery is underway. I personally followed this guideline and maybe waited even more. I also consulted my family doctor before starting climbing again to ensure I didn’t have diatasis recti. After doing weeks of soft physical rehab exercises and lots of walking to regain strength and endurance, I finally felt ready to climb again. I was by no mean a strong sports climber before pregnancy so I really had no pressure when I picked it up again and was therefore able to enjoy a very gradual, easy reconnection with the rock…and with my core muscles and my upper body. The pace that my baby’s routine would impose on us suited me just fine; a little walking, a little breastfeeding, a little climbing, eating some snacks, walking the baby some more so she could sleep,hanging out in the sun, climbing a little more and the day had gone by! No, your romantic life doesn’t end the day you pop that baby out, although it sometimes feels like a remote memory, especially when that little being is sucking up all your attention and your energy. On our family climbing trips,we’ve always been fortunate enough to also have wonderful friends joining us, which has first allowed us to take turns climbing, belaying and taking care of the baby. But what makes our friends even more wonderful is that, wether or not they have kids, they’ve offered to also take care of our daughter for shorts periods of time. This is allowed Hubby and I to take a few moments to ourselves… to soak in some hot springs, to tackle a route together just like in the old days, or even to catch up on sleep or get organized with groceries…yes, you’ve heard me; with a couple-of-months old, even grocery shopping IS a romantic activity. As mentioned earlier, before being a mom I didn’t care all that much for sports climbing, and to me, bouldering was not even something I was considering as climbing! My husband and I would spend any opportunity we had to go alpine climbing or climb multi-pitch routes. The odd bit of sports climbing I would was early season to get into alpine climbing shape. Well, because we don’t simply strap our baby onto our back and climb (for goodness sake! Seriously!) being new parents who didn’t want to give up on our passion, we had to adapt, and it proved wonderful. The beauty of sports climbing is its relatively simple logistic and the fact that the time commitment can be much shorter ( yes, we’ve had a few around the clock epics in the alpine before). You usually sports climb in fair weather, and in very pleasant environments. 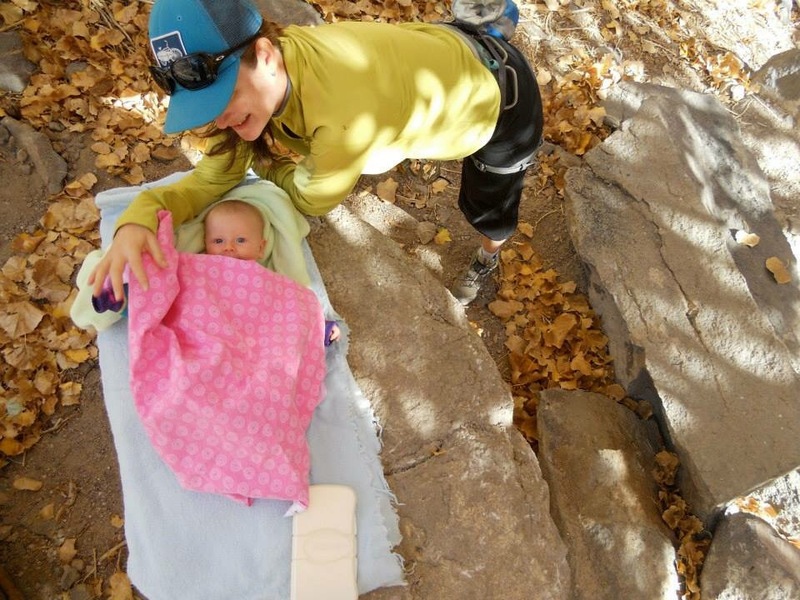 It also didn’t take long before we started realizing how much bouldering is adapted to climbing with a baby. Especially when you don’t have friends on hand to take turns belaying. I must even confess that since I have become a mom, I even picked up indoor climbing and I love it. It has become my weekly “me time” I get to spend with other mom friends. Although alpine climbing is still very dear to my heart, I love how easy crag, Boulder and indoor climbing is to juggle with a young family. I strongly believe people who say that there’s no point traveling with infants because they will never remember a thing or even says that traveling is detrimental for children are so wrong. Traveling, exploring new places, being exposed to new smells, new sights, new flavours ( even through breastmilk) will for sure imprints on babies soul and will contribute to who their are as humans. Openness is something intrinsic to children. Fear of differences is a learnt state. Tolerance, kindness, curiosity, adaptability are values that can be passed on right from birth. If a baby won’t have memories of a journey she was on when she was 2-months old, she will certainly have acquire sensations from it and will relate to your own memory of it as a parent, through stories and photos. To us, the very first trip we did as a family is closely linked to the wonderful memory of our daughter’s early age. Something that’s truly amazes me about young kids is that, when their basics needs are met and they feel safe and surrounded by the most important aspect of their little world; the presence of loving care-givers, they are really at home anywhere in the world.